One of the A303's larger services, although still providing nothing unexpected. It is due to host a line up of regular brands soon. 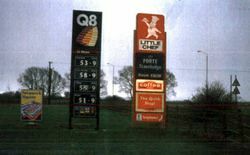 Signs outside the services in 1996. A spacious site, situated in the corner of the roundabout but with the entrance much further round than you might expect. It was built in a single plot of land they had purchased which had been isolated by the new roads. Lots of space was left for parking and landscaping, but a lack of care has seen it become bleak. In the middle of the complex of roads is an abandoned tourist information building. The large Little ChefHistory restaurant was deliberately placed next to the A303, with its entrance around the back. It gained a Coffee Stop, but then part of the building was siphoned off to become a Burger King in 1996, with its own dedicated restaurant. A Coffee Tempo! was then added, which was replaced by Little Chef Express. The building was chosen for the Wonderfully British refurbishment, which saw the side of the building given distinctive, red branding. Podimore was one of the last Little Chefs to continue trading right up until Euro Garages' use of the brand expired. It's thought their preferred franchisee, Starbucks, didn't want to share the building with the profitable Burger King. The EG Diner closed in June 2018 and reopened as a Greggs and Subway later in the year. The Burger King unit was refurbished and moved within the building to a new location, to create a new food court-style complex which is looking more like a standard EG Group set-up. The forecourt was originally branded Q8. MFG own the filling station, although it is operated by MRH management. 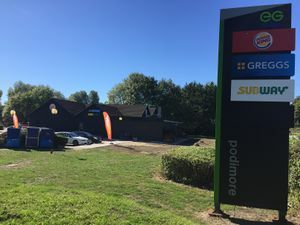 In June 2018, MFG were granted planning permission to demolish the current filling station and redevelop the site with the site gaining a larger shop and new pumps.